This article is specifically for Vectorworks 2018. If you are looking for instructions on how to uninstall another version, click HERE. In the Vectorworks 2018 application folder, normally found in C:/Program Files, double click the Uninstall icon. 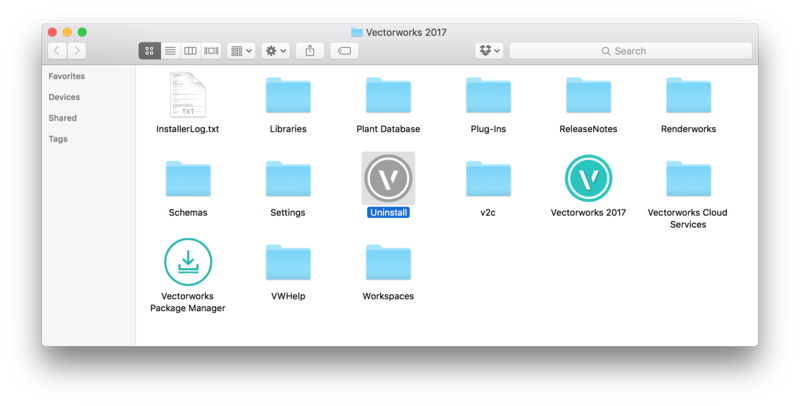 In the Vectorworks 2018 Application folder, there is an "Uninstall" application. Double click this to begin uninstalling Vectorworks 2018. Would/Should the "Uninstall" application do it's job properly and fully if the Vectorworks application folder had been brought over to a new computer vis Time Machine? Possibly, but we do not test that. I recommend against installing Vectorworks in this way, a proper clean installation is best. If an uninstaller is missing, what is the best way to uninstall 2018 on a mac? Can someone share the uninstaller from another mac?